Day One of NAB 2018 was getting our feet wet and going to the Blackmagic press conference, before roaming the South and Central Halls. While “mowing the lawn,” I came across some really fun stuff that filmmakers can use to get a little extra “umph” into their projects. I’m not really going to get into the whole spec sheet for the Blackmagic Pocket Cinema Camera 4K, since I wrote about it here. And the specs are pretty damn nice. 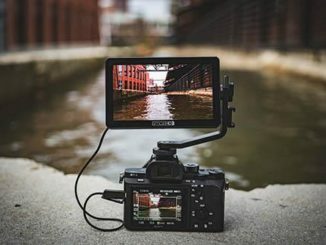 Blackmagic took their time and came up with a successor to the popular indy camera with one that is sure going to take short films and documentaries to the next level, while keeping the gear footprint fairly light. I was able to get some hands on time with the Pocket 4K and it’s fairly hefty at this stage, feeling very similar to the Canon 5D Mk. III in size and weight. BMD president Dan May told me that since I was holding an early prototype, and with another five months to go before the Pocket 4K ships, the weight is sure to drop some as the feature set goes up. But I was chomping at the bit to shoot with her, and I can’t wait to see some test footage. 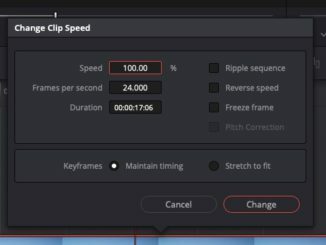 We also talked about the integration of Blackmagic Fusion into DaVinci Resolve 15, making it a wall to wall post production app for just about every phase of the finishing process. And it’s still $299 (the upgrade is free). I also got a chance to target the Central Hall and while heading to see the guys over at BoxCast, I swung by Rycote and saw a nifty new wind screen for smaller microphones mostly used for interviews and sound effects. The windscreen is affectionately called “the Baseball,” and it’s about the size as the rawhide for America’s past time. The Baseball comes in a few different sizes between 19-25mm and provides up to 30 db of wind noise attenuation. They also have a color coded ring so you can tell which one goes on which shotgun they were designed for. They also have optional deadcats for use in windier conditions. The Baseball was a result of hearing feedback from audio engineers who record out in the field, and they’ve managed to create a compact wind screen that is light, and doesn’t muffle the sound coming to the microphone. Cost of the Baseball Windscreen is $45 US. 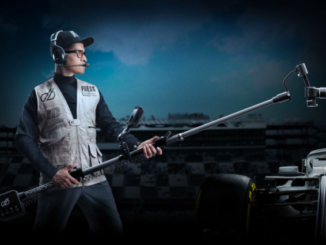 Additionally, Rycote has a nifty quiver for storing your collection of shotgun mics. The quiver is made out of high impact polycarbonate and you can stand on it without causing it to bow. Inside, there’s these cool adjustable plastic tubes that you slip your shotguns in. Adjustable because you can screw it the top to adjust the top to fit your particular microphone. Each quiver can hold four of them, and they come in two sizes. No word on pricing, but trust me on this, if they protect your collection of shotguns, it’s going to be worth it when it comes to the US. Then I made my way to Boxcast, and it was exciting news that this all in one streaming box and processing service was coming to B&H. 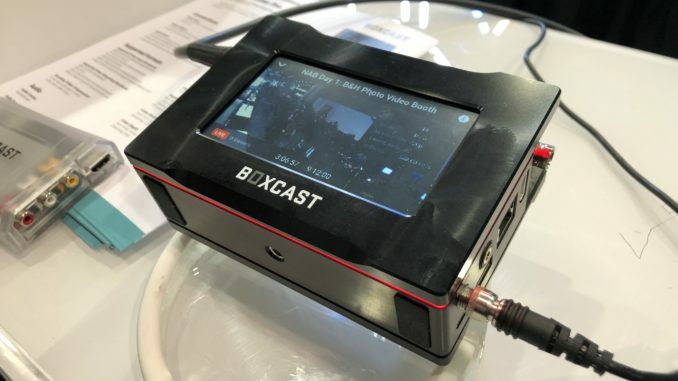 Boxcast Pro is a device that can handle up to four different 4K camera streams and incorporate them into a single live broadcast to Facebook Live, YouTube Live, your own independent web stream, and even creating your own Roku streaming channel. 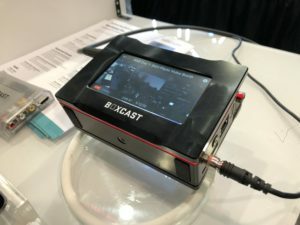 We first saw Boxcast Pro last year at NAB and I was sold on it then. Since, they’ve gone through six different beta tests to really dial in the feature set and refine the overall design. Now it not only performs like a pro grade streaming solution, but it looks it too, with a machined aluminum case, that has multi colored LED strips embedded into it that will warn you if your connection goes off line do to a loose cable. These guys thought of just about everything. Cost of Boxcast is around $3400, but it comes with a full year of video processing on the back end at no extra charge. 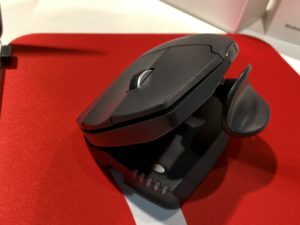 Well, this one is an adjustable mouse, with hinged body tilt and articulating thumb support design that enables a user to adjust his mouse to ergonomically fit the natural orientation of your hand, rather than the uncomfortable flattened clam shell design that just about every mouse has. To be able to adjust 4 key points of articulation, this mouse becomes instantly personal to you, and enables a user to use it for long editing sessions without it becoming uncomfortable. 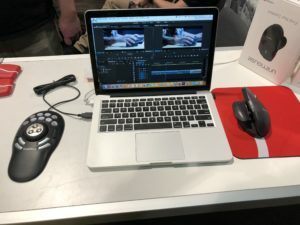 Contour is selling the UniMouse for under $70, but for NAB, there’s a $50 special. Then there was their ShuttlePro V2 computer controller. A stylish take on your typical shuttle controller, this peripheral has 15 programmable function buttons that can be assigned custom tasks. The selling point here is that the ShuttlePro supports over 100 different post production applications and you can load in the presets with a simple click. Put this together with the Unimouse and those overnight editing sessions are going to be a lot more comfortable. That’s it for day one. Tomorrow I’ll be swinging by SmallHD, DJI (which has a cool robot camera device for precision motion control), more streaming and podcasting tech, and of course, more camera gear! I’ll also be filing my reports every day at 5pm, live, with Digital Production Buzz and the NAB ShowBuzz live stream. Listen at NABShowBuzz.com!